1975. WHO DO YOU SAY THAT I AM? Thanks for making these files available. Hard to find. Question: is there one missing? I keep finding references to Van Tills “In defense of Biblical Christianity” vol 1, 2, etc…but I can’t find a vol 5. Thoughts…and again…I really appreciate your good work. Hi, several titles are missing due to being under copyright by P&R Publishing. Defense of the Faith, Introduction to Systematic Theology, and The Christian Theory of Knowledge are among them. If I obtain permission from P&R to do so, I will add them, otherwise I will not. However I have more to add as time permits. Thank you for the encouraging words! No problem…thought I had missed it somewhere. Thank you again for your efforts in providing these OUTSTANDING resources. “If I profess with the loudest voice and clearest exposition every portion of the truth of God except precisely that little point which the world and the devil are at that moment attacking, I am not confessing Christ, however boldly I may be professing Christ. Where the battle rages, there the loyalty of the soldier is proved; and to be steady on all the battlefield besides, is mere flight and disgrace if he flinches at that point.” –Martin Luther. Is is possible to find VT’s little booklet, “The Scale of Being & Modern Dimensionalism”? After searching, the most I could come up with is an article titled “Dimensionalism Or The Word”, Chapter 7 of “Christianity in Conflict” is “Modern Dimensionalism”, Chapter 2 from “The Confession of 1967” is “The New Dimensionalism”. Either “The Scale of Being & Modern Dimensionalism” is a.) not by Van Til, b.) does not exist, or c.) it is extremely rare and I should love to have a copy! This is a great resource! Do your pages follow the pages in the original? That would be really handy for academic citation. Thank you. No sir, the pages do not follow the original. The only way to achieve that result would be to do actual book scans of the books. These are from the Libronix Digital Library electronic text copied and pasted into MS Word, in some instances I created a table of contents, and created links within the document to the table of contents, that is navigation from table of contents to places, and from places back to table of contents, to make them more user friendly, unlike so many PDF documents. Because the text is put into MS Word, more text fits to a page than would fit in the originals. In addition to table of contents, and linking, I also manually went through each book and spaced the text out so that new chapters would begin at the beginning of a new page, and carefully searched for places where a heading would be at the bottom of a page just before a page break, and spaced it out so that where a heading is, there is at least a couple lines of text following before a page break. Yes, it has been very tedious and time consuming work, but worth it, at least to me. 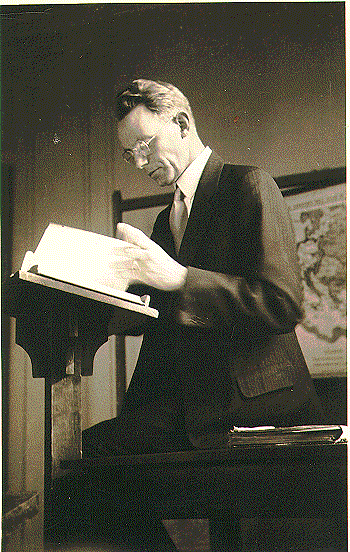 One simple reason is because I can put Van Til’s works into any and every reading format available. I’ve even created my own personal theWord Bible Software module with Van Til’s works from Rich Text copies of the Word docs. There are companies who put the original page numbers in their electronic documents. Westlaw puts an asterisk and then the page number where a new page number started in the print copy (e.g. *79). If you had the print copy of one of Van Til’s books, you could add the page numbers in the MS Word document, and then convert it to PDF, although I realize that that would require a lot of time on your part. But it would be help people writing academic papers. Yes, time and money I do not have. In addition to the Libronix (Logos) digitized works, I do own a number of printed books and pamphlets by Van Til that I purchased from the online WTS bookstore years ago. When I quote Van Til, at the end of the quote, I cite the title, chapter, and sub-section of the particular work. Because his works tend to have so many sub-sections, it’s relatively easy to double check quotes with a printed copy. For such a tedious time consuming task, I would definitely have to be paid descent money by a company, or very generous donation(s) to add page numbers, neither of which are likely to happen. Thank you for your work. The Lord bless you Sir. Thank you for posting these resources! Brother are this resources free of copyright? Can they be used freely with no problem at all? Oh no my brother, what I meant was if these posts on your page can be read without problem. I do not want to make commercial use of this, just read it (and all other posts here). I asked it exactly because of what you said, the matter of copyrights by Dr. Van Til. So can I read them legally? This is the most useful thing I have found on the internet in quite a while. Thank you. I would very much like to receive a hard copy of “The Case of Calvinisim” I have no other way of getting this resource. I am a contract lecturer in South Africa, Kwazulu Natal.